One of the things I love about my bullet journal is that it allows me to unleash my inner creativity even though I'm not really talented as an artist. Using simple layouts, I'm able to use fun hand lettering and easy doodles to make it my own. A weekly bujo spread give me the opportunity to break out the all my favorite supplies such as markers, washi tape, stamps, and stickers. The best part, there are no rules. If i want to have every week completely different, I can. Sometimes my spreads looks amazing...other times, not so much. I also love that I can make my weekly spread hold a ton of information like mood trackers and habit trackers. Other weeks, I just make a simple layout of my appointments and to-dos. Below you'll find 12 of fun and easy-to-replicate weekly spread ideas that you can make! my.happy.bujo created such a bright and happy weekly page spread and you can too. Blades of green grass were made Tombow Markers and edged with a strip of yellow washi tape to anchor it. The corners of each day have two stripes of green and yellow to bring the color theme throughout the page. karlynzoya brings us a cheerful floral weekly page spread in her bullet journal. She made her daily boxes a bit smaller to provide room for a monthly calendar, goal box, and quote. The easy to draw flowers dangle from the top of the page and are accented with Mildliners. Love this gratitude quote, too! "It is not happy people who are grateful, it is grateful people who are happy." 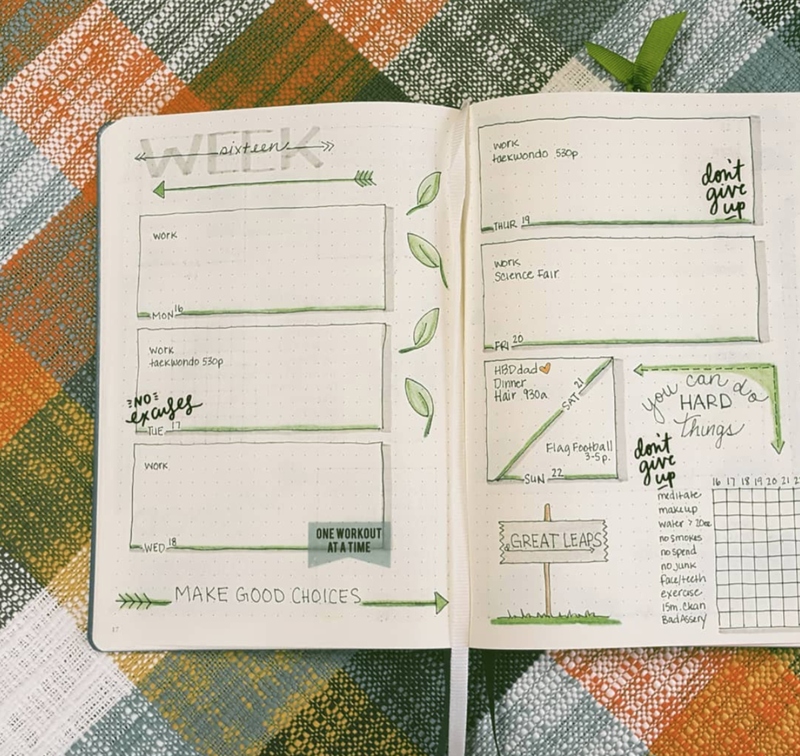 thegreenglasses loves to create green bullet journal spreads, too! She made simple boxes for the dailies and then accented each with green markers, arrows, leaves, and even a few motivational planner stickers. On the right is a tracker section and a quote, "you can do hard things." createwithanncakes's weekly spread makes me happy. It's so cute with a rubber duck covered with bubbles drawn in the corner. The dailies are created by making simple banners with each date and then the days of the week are written in cursive in the line. Simple, yet creative and pretty! Pretty in pink! amys_bujo in her Leuchtturm Dot Journal highlights the school week showing Monday thru Friday. Each date is written in a simple box with a lined drop shadow then the days of the week are written out in cursive hand lettering. There's even a spot to record assignments. Cute flowers and leaves decorate the page and are accented with Tombow Pastel Dual Brush Pens and a black marker. bulletjournal.cat made such a simple and charming weekly spread! The days of the week are dangling from the top accented by a few lanterns hanging from a tree. Adorable! stampingjacq created a pretty weekly spread in a blue and green floral theme. The dates are really big at the top with the days of the week written out underneath them. This spread also records her mood and favorite tracking goals. 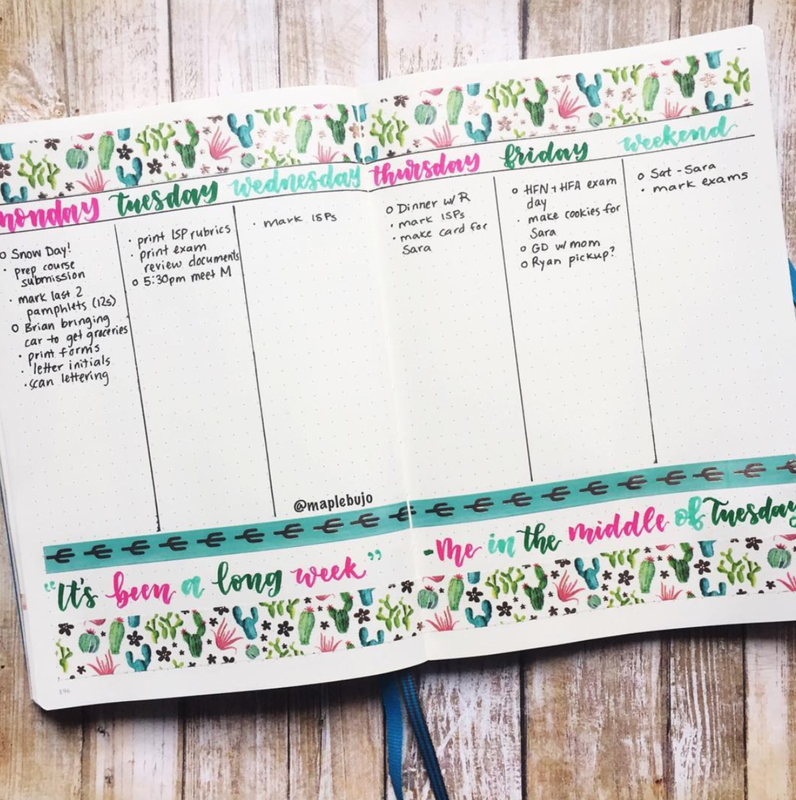 pharmdplanner made a fresh weekly spread using long boxes to create her dailies. The days of the week are written in black cursive with a large yellow letter to add interest behind it. At the top is a sweet citrus drawing with lemons, limes, and oranges with the quote, "Each day is a fresh start." This bujo spread is perfection! kikadesk made a two week spread on these pages. Pretty calligraphy, days circled with marker, and lots of pretty plants make this layout a winner! 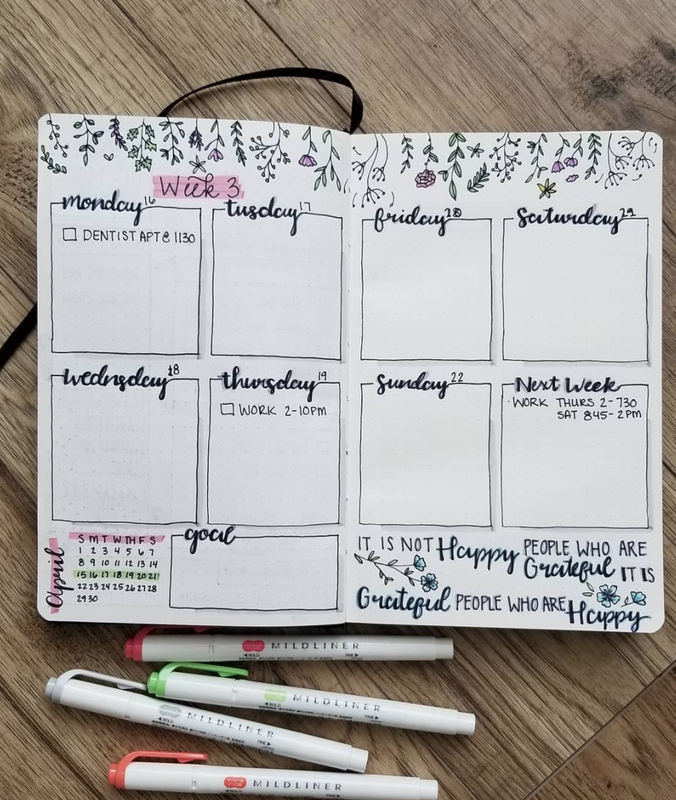 happybujolife got creative with cherry blossoms along the top of this weekly spread. A tiny monthly calendar in the upper right corner give a glance where the spread falls in the month. Simple lines block out each day marked with a calligraphy header. So clean any pretty! madebyteenie used colorful washi tape and banners to make a clean weekly spread that I want to replicate. A pretty combination of blue and red pens accents the rest of the page. 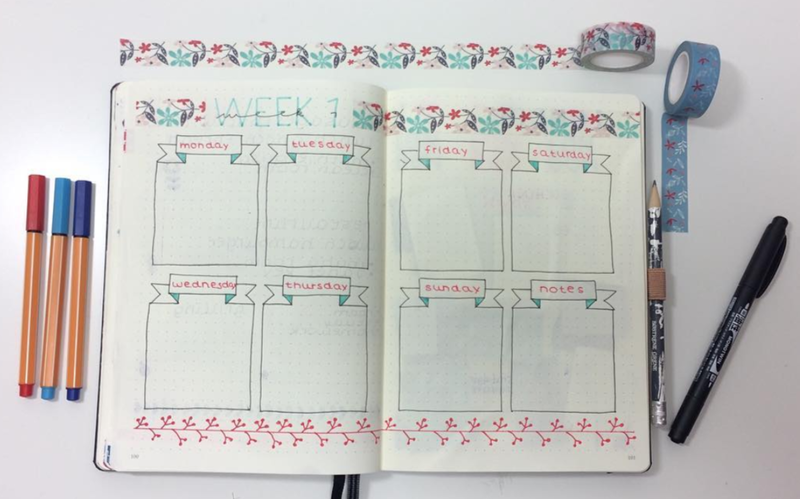 maplebujo created an adorable spread by utilizing lots of wash tape! Colorful cacti in strips along with hand written quotes in coordinating colors make this a page you'll love to write on all week. Now it's your turn! Every week, get creative and have fun making your weekly spread!